Our Folding Trunk Organizer follows a practical philosophy - it's there when you need it, out of the way when you don't. Ingenious! It's made with heavy-duty, highly durable 300 denier polyester, plastic structural panels and a hard hook and loop fastener on the bottom to keep it in place on carpeted surfaces. It features a divided interior, four exterior pockets for smaller items and loop handles on either end. When not in use, the Folding Trunk Organizer folds flat - perfect for storing in a car trunk or the back end of an SUV. Folding Trunk Organizer is rated 4.8 out of 5 by 103. Rated 5 out of 5 by Noro99 from Highly Recommend I can't stand the way plastic bags of groceries spill out items to roll around while I'm driving. This is a perfect solution to keep the bags intact. And bottles. I'm planning on getting a 2nd caddy so my trunk will always be organized, no matter what I put in. A bonus is the front pockets that can hold small items. Rated 4 out of 5 by Basbwd from Does the job I've been wanting to corral some things in the trunk for quite a while but couldn't decide what kind of organizer to get. This one is inexpensive, but it works for me. I like the divided compartment and the mesh pouches on the sides. I keep some emergency items in the one compartment and the other is good for some smaller shopping packages. Rated 5 out of 5 by PattH from A must-have accessory! I've had one of these in my minivan for years. When my daughter got a new SUV, I bought one for her. Without it, groceries, etc., roll all over the place while you're driving. It's made of sturdy nylon, and I love how it folds flat for storage (though unless I have a carload of people, I just leave it up for every-day use). Rated 5 out of 5 by consultant from perfect for our employees This item is exactly what our folks needed to keep various items organized and stored in their vehicles for quick access. Rated 5 out of 5 by JJMom23 from Great to hold my stuff This is great to have in the back of my SUV. It holds a sweatshirt, tshirt, towels, umbrella's and much more. I love that it has some velcro on the bottom to hold it in place so it doesn't slide around like the box I had back there prior. Rated 5 out of 5 by nuttyorganizer from My trunk is organized!!!!!!!!!!!!!! Love these organizers! My groceries don't spill out all over the trunk. Great for ANY items. So pleased with them I gave 2 as a gift to a friend. She loves them! Can't say enough about these - quality, size, ease of use and storage - fabulous! Rated 5 out of 5 by Katrin from Good product This is great and I was able to fold it down to one cube for a smaller load. Rated 5 out of 5 by lucyloodle from can hardle "contain" myself! This trunk organizer is exactly what I needed to reign in all of my stuff that had been rolling around back there. As a sales person, my car serves as my office, so keeping things oganized is a must. I've used many types of tubs and boxes, but this collapsible version is much more versatile. Think I'm going to be adding a few more of these units...as I am a neat-freak. Rated 5 out of 5 by uga89 from Very Useful This fits the back of a Toyota Yaris perfectly. A great way to keep milk from becoming a missle on the way home. Rated 5 out of 5 by Oriolezgurl from Handy and Handsome I wanted a storage organizer for my trunk and looked at lots of them online. I was concerned about the quality since I couldn't actually see/touch them and didn't want to buy something that wasn't functional. Then, I thought of a The a Container Store, as they always offer quality, well-made products at a reasonable price. I ordered the trunk organizer and am very happy with it. It fits nicely under the covered area of my Altima trunk, good quality, handsome, waterproof, and durable. Very happy! Rated 5 out of 5 by Chicsheshe from no rolling fruit or cans. The fold up ability is great for when not in use. Also the velcro snaps that hold it in place are great extra feature. No surprises when you get your food or sports equipment. Got 3 -- two for SUV and one for car trunk.. good for curvy or bumpy roads. Rated 4 out of 5 by AFitzgerald from ideal Trunk Solution NIce product, I like that it can be folded flat when not in use or when only one cube is needed. The product is sturdy and holds quite a bit. Rated 5 out of 5 by islandlady from Great for jeeps I have a jeep and if I put bags of groceries in the back, they fall out before I reach home. Now I have a way to keep them in bags and handy, not falling under the seat! I also bought "S" hooks when there. Can't find them on the website, but they were a great price. My husband built a thing to hang my pots and pans and it can be difficult to find the right size hooks without spending a fortune. I bought 6 packs to have some extra's. Rated 5 out of 5 by WingManCrash from Great Storage I purchased this to keep items from rolling around in the trunk. It fits in a convertible and when not in used, it folds flat and when needed, is a snap to set up and use. This item does not have any instructions so pay attention when you open it up to use so you can figure out how to fold back into a square. Rated 5 out of 5 by CATWOMAN777 from FANTASTIC!!!!! I have a Jeep Grand Cherokee and my groceries and other items were always rolling around in the back. Some items have almost fallen out of the vehicle when I open the hatch, I don't have to worry about that now. It works the way it is supposed to. Rated 5 out of 5 by SamLolli from Looked all over for a trunk organizer that was a good price as well as a good product. You guys had it! Wonderful price, and even better designed product. Didn't realize it had velcro to keep it in place and that made me even more excited. The side pockets are very helpful too. Looking next to get one of the trunk trays to keep bigger items in place! Rated 5 out of 5 by mckeeto from Works great and stays in place no matter how quickly we take turns! 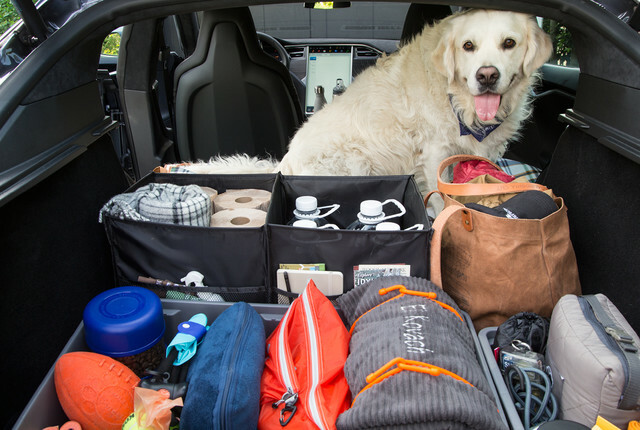 Rated 5 out of 5 by pets4me from Folding Trunk Organizer I have a small SUV and these organizers are fantastic! I have one that I use for all my "junk", i.e., window cleaner, paper towels, tissues, sunglasses, etc. Then I have a second one that I use for perishable groceries, i.e., eggs, bread, etc. I really like them because they are a great size and can be folded and put away when not being used. Rated 5 out of 5 by DVSIndy from Great Product Really helps keep my trunk organized. I can easily move the item from the back of the SUV to the front when I need to use the back for the dogs :) I love the side pockets, too-great for hats, umbrellas, etc. Great value for the price. Rated 2 out of 5 by littlez from Not Very Sturdy I love the functionality of this piece, but it is not very sturdy. It ripped within the first month of use. If you are never going to remove it from your trunk, it would be fine. But it is not very sturdy if you need to move it from place to place. Rated 5 out of 5 by Lovely4823 from Love My Trunk Now This organizer has helped me declutter my trunk. I run an animal shelter and my car is always a disaster. I feel put together and ready for travel with this organizer. Rated 5 out of 5 by Daffyrs1 from Folding Trunk Organizer One of the best purchases I have ever made. This trunk organizer keeps everything in one place, plus it's great for shopping bags...NO more spillage all over my trunk. Everything stays in the bag & won't tip over. I Love this organizer, I'm going to buy one for my daughter & daughter-in-law. I keep my folding umbrella in one pocket & eco friendly bags in the bigger pockets on the sides. Sticks to the carpet & won't move...great feature! Rated 5 out of 5 by SandraB from Exactly what I needed These organizers for the trunk are large, sturdy and just perfect for groceries, etc. After purchasing one for myself, I also purchased 2 for my parents for their car. They keep my groceries from rolling all over the back in my SUV. Would highly recommend this product!! Rated 5 out of 5 by DeeCruise from Perfect. Wasn't looking for anything fancy. My son is going to college and wanted an organizer for his trunk to put books.. This was ideal. Its a perfect size and the quality is good. The price is excellent! Rated 3 out of 5 by archerdv from Functional but somewhat fragile I bought this item almost two weeks ago and have noticed that it is beginning to tear in the middle front edge. The fabric is separating from the hard board between the cubes. Rated 5 out of 5 by grangegal from Great Buy Just what I've been looking for. The Trunk Organizer is perfect for the back of my Suburban. It holds plenty of groceries and other purchases & keeps them contained in one space without rolling around in the back. I definitely recommend it. I have a car organizer and my problem is it flops over and falls inside it's self does anyone know if this one stays open and stays right side up? Yes! It's very sturdy and I've never had it collapse even when not full. Can you expand just one half of the organizer or must you unfold both sides? Only one half of the Folding Trunk Organizer can be opened at a time. However, a clip (not included) may be required to keep the other side closed when not in use. Will this fit inside of the &quot;Ultra Storage Trunk with Wheels&quot;, specifically the height? The dog days of summer bring with it a wanderlust to pack up the car and hit the road. And that's just what this dog Eli - and his dad David, did!